The Liberal Democrats hit the skids in the 2014 European elections as four parties polled ahead of them including victors, UKIP. Nigel Farage’s “people’s army” (frightening bombast I know) topped the polls with 4.35m votes and 24 MEPs, a whopping increase of 11 seats. Labour scored 20 MEPS whilst the Conservatives elected 19, finishing third in the popular vote for the first time in their 180-year history. Both the Green party and the Scottish Nationals captured more MEPs than the Liberal Democrats, who lost eleven of their twelve seats. The main story of the European elections in Britain was the charge up the polls by UKIP. The success of the pestiferous purple clan can be attributed to two things; UKIP’s forthrightness in approaching the subject of immigration and their ability to make sure their candidates and in particular, their leader come across as down-to-earth rather than as the political elite he actually is. Despite the BBC’s protestations, UKIP has not caused an earthquake in British politics. Whilst, it is a remarkable if not irresponsible achievement for a party outside the ‘big three’ to win an election, it’s worth noting only 29% of the 33% of people that bothered to vote voted UKIP, accounting for just 9% of the UK’s electorate. Given how staunch ‘Kippers’ are in their support of UKIP’s ‘imbecillic trailblazer and that solitary view they have, it’s safe to say that the majority of ‘Kippers’ voted. In fact, the powers that be in Westminster have alienated much of the public and driven them in to the arms of ale-swilling fox, Nige (you still have no MPs by the way). Helping hand… The right-wing media fed the electorate a diet of fear and xenophobia. Unsurprisingly to anyone who doesn’t turn a blind eye to UKIP’s plethora of scandals; there are several falsities surrounding their campaign. Ones that have done nothing to harm their vote share in these elections. On last Thursday’s Question Time, UKIP were questioned about their reliance on anti-EU and anti-immigration propaganda and the reasons to why they don’t focus on any other policies. Simply, they wouldn’t have won if they did. Unfortunately for the rest of us, Nigel Farage is an adept yet duplicitous man. Do you think people would vote for UKIP if it was common knowledge that they oppose equal gender rights, they campaign for reintroduction of hand guns and would allow the ivory trade to continue? Well, let’s hope they won’t seeing as the rest of UKIP’s views are likely to get a greater airing now this European business is put to bed. UKIP’s anti-establishment disposition is also not all it appears to be, in fact one of the party’s MEPs is better known by his title; the 10th Earl of Dartmouth. And Nigel Farage is hardly the average Joe he claims to be either. He was pictured modestly addressing his subjects from the golden staircase of the Ritz for his birthday just a couple of months ago. Adversely, it was a horror show for the Liberal Democrats. Whilst, it was predicted that the yellow party would suffer in this election, losing all but one MEP and falling behind the Green party as well as Lab-Con and UKIP was a monumental blow. The media of course have been declaring that the Lib Dems have flatlined and are heading for extinction, but that is not the case. David Dimbleby even claimed that the Lib Dems only held on to their one MEP by 16 votes rather than by the actual 7,000. There will always be a market for liberalism in British politics. Despite their reputation for moderation and fence-sitting, the Lib Dems were staunch in their support of the EU leading in to the election, assuming a rather extreme view – declaring themselves the “party of IN”. Despite the party taking a hammering, having their vote share halved, Britain actually voted more in favour of pro-EU parties than the Eurosceptics, surely demonstrating that the Lib Dems’ message isn’t the problem but the messenger himself. Time is surely up for Nick Clegg, who has led the Lib Dems from an opinion poll rating above Labour’s in 2010 to one below the Green party just four years later. In actuality, the Liberal Democrats have always been fairly popular on a policy basis but as Lynne Featherstone touched upon on BBC News, the Liberal Democrats and particularly Nick Clegg have disillusioned far too many voters, and irreparably so. Europhilic…The UK have demonstrated support for pro-EU parties. There were very few positives that came from Thursday’s election. But at the very least, the contemptible British National Party are seemingly on their way out, having had their share cut drastically. 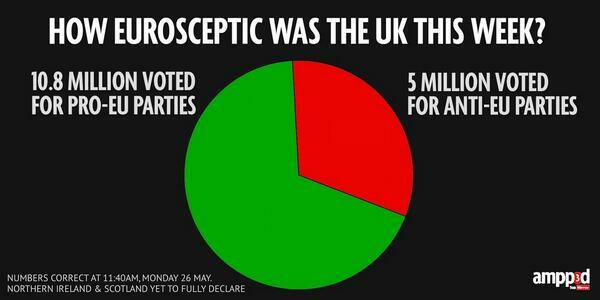 However, it’s not as good as it seems as UKIP have effectively monopolised the jingoistic vote. UKIP are still not on course to win a single seat at next year’s elections but these results may give Britain and other nation’s greater bargaining power in renegotiating terms of membership in the EU – something I’m definitely not opposed to (and nor are the Liberal Democrats for that matter). 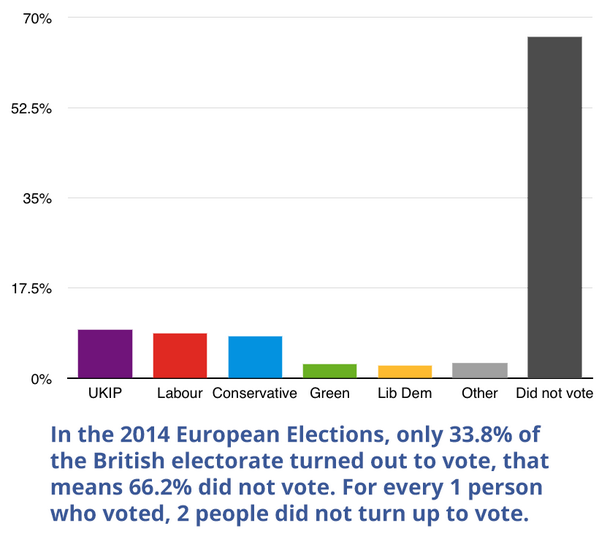 The real problem… Voter turnout allowed UKIP’s victory. Unfortunately, there are plenty of negatives to take from these elections too. For instance, people like Roger Helmer will continue to represent my constituency in the European parliament, as an anti-foreign, anti-gay, anti-female politician. It’s almost unthinkable that he has been elected by a landslide in 2014. The electorate have replaced some of the hardest working MEPs in the Liberal Democrats, Labour and the Conservatives with the indolent UKIP, a party whose representatives regularly don’t even turn up. Actually, it seems only right to congratulate UKIP and their millions of voters for surrendering control of our affairs in Europe to a party who deems the very process to be pointless. Overall, the right-wing media and their corresponding parties have changed the climate of the European parliament. The bombastically charged temper of fear has swept control of Europe in all too familiar fashion and mostly because “voting isn’t important”. Leicester City have finally returned to the pinnacle of the English league ladder. It’s been a decade of ups and mainly downs for the Foxes, in their quest to make it back in to the elite twenty. In such time, the club has had a complete makeover, so here is what fans of the Premier League can expect from the East Midlands’ new boys next term. The saying goes that “you can’t win anything with kids”. City disproved that among many other clichés last season when their young squad led them to Championship glory with 102 points. Whilst, Leicester have benefited from the experience of older players such as Gary Taylor-Fletcher, Marcin Wasilewski and club captain, Wes Morgan, several of City’s key players of last term were under the age of 24. In defence, academy graduates Liam Moore and Jeff Schlupp, both 21 have asserted themselves as major players with the former attracting interest from top Premier League clubs and the latter being named amongst Ghana’s provisional World Cup squad after adapting to a new position last term. However, it’s Leicester’s midfield that boasts the greatest plethora of young talent. Centre midfield maestros, player of the season Danny Drinkwater, 24 and young player of the season Matty James, 22 have formed an impenetrable partnership in midfield, building on their synergy whilst youngsters at Manchester United. City can also boast continental flair on the wings in the form of terrace hero Anthony Knockaert, 22 and Algerian international Riyad Mahrez, 23 who are both capable of producing flashes of brilliance. Both will surely make the step up in to the classier surroundings of the top flight. City also possess a crowd of players with points to prove in the top-flight. Fierce competitor Kasper Schmeichel will be hoping to shake his father’s reputation and establish himself in his own right whist showing he’s worthy of being linked with the likes of Milan and Real Madrid. David Nugent and Paul Konchesky each will be eager to demonstrate that they’re still good enough for top level football whilst top-flight débutant Wes Morgan would love to show he can make the step up having twice been named in the Championship team of the Season. But most of all, ex-Fleetwood Town striker Jamie Vardy will be desperate to complete his remarkable journey from the Conference to the Premier League in just three short years. The Sheffield-born striker’s lightning pace and eye for a finish will certainly only propel his unfathomably meteoric rise through the divisions. Despite what Sean Dyche may have told you, Nigel Pearson has worked wonders to transform a team full of Sven’s high-earning flops in to a hungry side ready for the Premier League. Having spent next to nothing this season, Pearson’s desire to stick largely with the same side that fell agonisingly short the season prior has clearly paid off. In truth, when Pearson and his head of recruitment Steve Walsh (no, not the City legend) do pull off a wonder signing, it is usually on the cheap for an unknown talent like the aforementioned Knockaert and Mahrez. In fact, expect any Summer City signings to impress – Steve Walsh was the man that recommended Chelsea legend Didier Drogba to Jose Mourinho. The Foxes also boast a rigorous and meticulous work ethic among their backroom staff as documented on Late Kick Off. Pearson’s staff’s attention to detail as well as their genuine talent to manage the game with precision in all areas will be crucial if the Foxes are to stay up next year. Make no mistake, Nigel Pearson does not implement a negative philosophy in to his sides playing style, no matter what the now thoroughly entertaining Hull City tell you *rolls eyes*. Actually, City’s current leader has the two highest win rates of any of Leicester’s permanent managers, both at over 50%. Leicester managed to salvage a remarkable 21 points from losing positions during the last campaign. The Foxes also managed to pick up 47 points on the road including wins at promotion rivals Burnley, Derby County and Queens Park Rangers. In total, City managed to win thirty-one of their league games last season, drawing just nine. The philosophy of playing to win against the sides around you, even away from home, is one that Pearson has expressed an unwillingness to change in the Premier League, so expect Leicester to play to their strengths at the likes of Selhurst Park and The Hawthorns next season. Thankfully, Leicester seem to possess owners with their heads screwed on. Despite the initially wrong approach adopted in 2011, the Srivaddhanaprabhas have been a blessing for the club. Both Vichai, the chairman and his son, vice chairman Aiyawatt, have implemented the practices of patience and progress in their bid to restore Leicester’s lost stature. In fact, just today in a press conference in Thailand, Vichai outlined his commitment to re-establishing Leicester in the Premier League by pledging to spend up to £180m in order for the club to reach Europe, not that the shrewd Nigel Pearson will spend anywhere near that amount. However, their aims have remained somewhat realistic albeit ambitious by acknowledging the need to consolidate for three seasons before Leicester launch a surge for intercontinental competition. I’m probably a little biased when I say that Leicester City will enhance the Premier League next season. A proud, well supported, traditional club with the funds and facilities to make a real go of things next season. Maybe it’s because of the reasons above or the fact that no side has ever gone down after winning promotion with 100+ points or maybe it’s just blind loyalty. But I just cannot see Leicester City relinquishing their coveted place in the top flight next season. I say this with the great risk of looking a total arse in twelve months time but Leicester City are in the Premier League and they are here to stay. Today, Greg Dyke’s FA commission of morons outlined plans to introduce the ‘B’ teams of Premier League clubs in to the Football League and Football Conference to compete among lower league professional clubs. Dyke and his cohorts believe this will serve to benefit the England national team and those poor old Premier League clubs who seemingly have their hands tied in the prison of too much choice. To me it seems entirely nonsensical. The idea that shoving a team of up and coming players in to the newly formed ‘Football League Three’ to compete against the likes of Wycombe Wanderers and Torquay United will not excel their development. It certainly wouldn’t make them better suited for the transition to top-level football, well no more so than actually playing in the top-flight. Besides, what’s wrong with the existing U21 and U18 leagues? They’re competitive divisions for progressing players. There isn’t a huge gap in quality between lower league football and the top-end of youth football, so why risk undermining the entirety of the English game for the same results? Dyke’s committee seems to think that Premier League sides are unable to provide young English players with enough opportunities, so why not place greater emphasis on increasing the compulsory number of home-grown players in the matchday squad? Current Premier League leaders Manchester City had just four in their seventeen that beat Aston Villa 4-0 last night. A number that has been lower at times during this season. The system isn’t unfamiliar in European football leagues with Spain implementing the system since the 1940s and only recently have Spain’s national side been a major world force in football. An impressively quick turn around, I’m sure you’ll agree. Another international giant in Germany is trying to move away from ‘B’ teams in domestic leagues citing money issues as a major problem. It’s also worth noting that Brazil, the world’s most successful international team has never had ‘B’ sides in their leagues and it has seemingly never hampered them. To put it plainly, the evidence to suggest ‘B’ teams improves national sides is not really there. Why seems even more unjust is the fact that the elite’s preference for foreign talent will only serve to damage the Football League clubs. It doesn’t seem right that teams such as Portsmouth and Sheffield United will deign to play Hull City’s reserves whilst Port Vale could face a Potteries derby against Stoke City’s second string in front of 63 people. And we’re supposed to believe these occurrences will better our fortunes on the international stage? League One and League Two boast higher aggregate attendances than the top tiers in Russia, Ukraine, Belgium and Portugal. The English league ladder is admired around the globe, the passion and intensity in lower league football is scarcely found away from England and the FA seemingly want to dismantle that just because Premier League sides won’t take a punt on home-grown talent. Attendances will fall as clubs are forced to play the overlooked players of the elite English sides, a prospect Football League fans will not be ‘excited about’ in spire of Danny Mills’ moronic prediction. Regardless, how much of a difference would it make to Aston Villa to have players like Jack Grealish play for their ‘B’ side rather than playing on loan for Notts County, who would actually care about their placing in the league ladder? Furthermore, the boot is put in to the Conference sides too who struggle enough to gain promotion to the Football League with just two spots available, having traditional clubs like Grimsby Town, Wrexham and Cambridge United suffer because Newcastle United would rather turn to France than England for their personnel doesn’t seem fair. The FA are out of touch with English football, the fans don’t want to see their proud clubs reduced to competing against reserves. It’s humiliating, unnecessary and more importantly unfair to the existing Football League Clubs. Whilst it might prove beneficial to the top tier clubs, it will do more harm to the lower leagues. Why is the FA so intent on furthering the gap between the elite of English football and the rest? Even now, as a fan of a Premier League club, I don’t want to see Leicester City B lining up at Spotland in 2017. England’s footballing body would do better to shift focus on player development and increasing top-flight opportunities for young players by putting a cap on foreign players in match-day squads. There’s nothing that English football fans love more than club football and ‘B’ teams would simply destroy that.